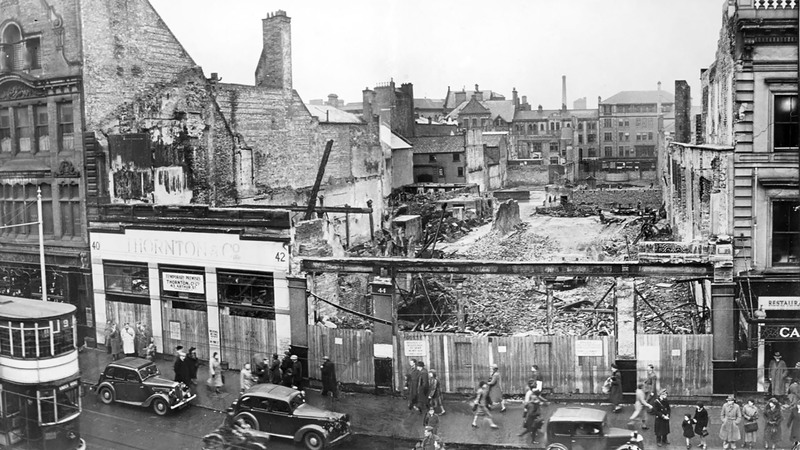 Donegall Street, Belfast, Co. Antrim was a scene of destruction in 1941 as Luftwaffe bombs flattened buildings in what became known as the Belfast Blitz. Photographers from the Belfast Telegraph captured the aftermath of the Belfast Blitz in 1941 when Luftwaffe bombs devastated the Donegall Place area. Belfast Telegraph/NMNI Photograph: The ruins of Brands' Emporium in the Ulster Arcade on Donegall Place, Belfast, Co. Antrim allow the photographer to see through to Arthur Street in the distance. Photo taken in 1941. Copyright unknown. If you enjoyed this post on "Donegall Place, Belfast, Co. Antrim", please share with your friends and followers.